For the first time, more U.S. households subscribe to a streaming service than to traditional pay TV, according to a new report by Deloitte. The report, Deloitte’s 13th survey of digital media trends, found that, more than before, consumers are customizing their media consumption experience with multiple video, music and gaming subscriptions. 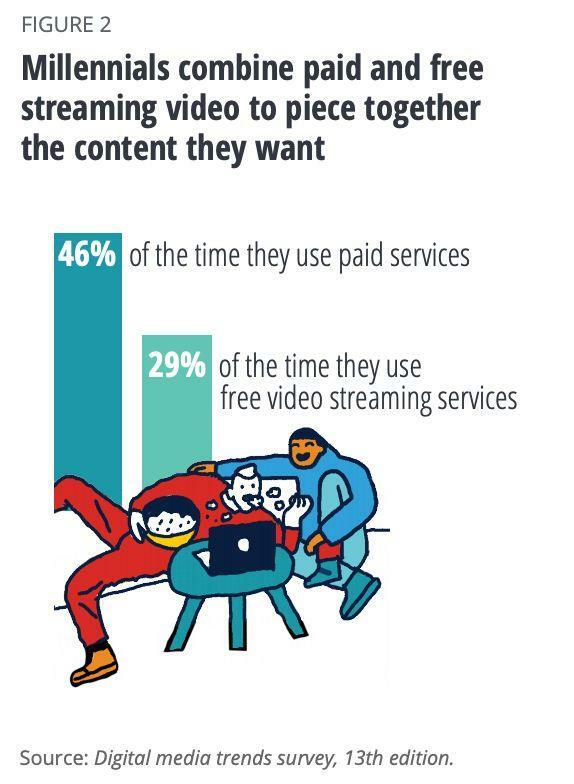 And since it’s been doing this survey, more respondents have at least one streaming video subscription (69%) than have a traditional pay TV subscription (65%), Deloitte says. According to Deloitte, which surveyed more than 2,000 people, 43% of households are subscribed to both a streaming platform and pay TV. Among millennials, 88% are subscribed to a video streaming service, compared to 51% who prefer pay TV. 80% of Gen Z consumers (who are now between 18 and 24 years old) subscribed to video streaming, with 57% sticking to traditional pay TV. 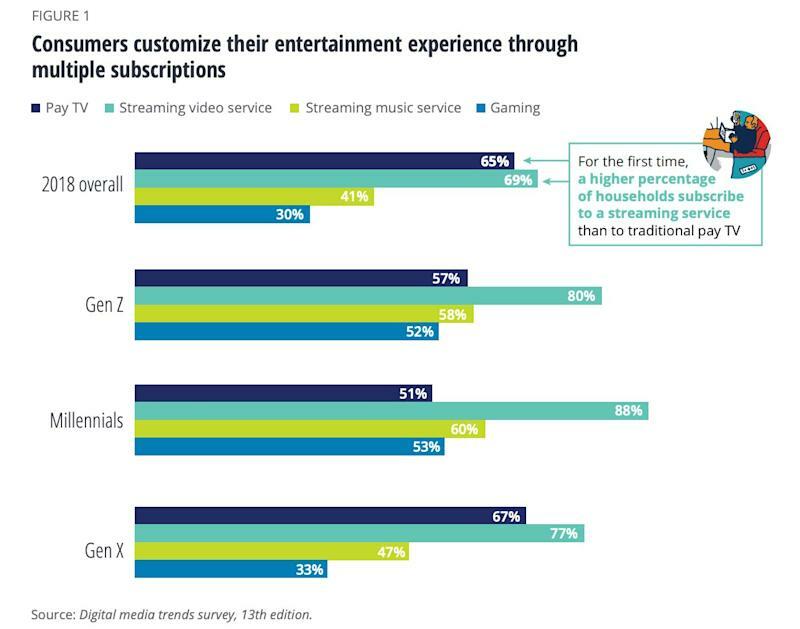 Consumers are also adding gaming and music subscriptions to their video streaming, with 53% of millennials and 52% of Gen Z consumers subscribing to video game platforms, and about 60% of millennial and Gen Z consumers subscribing to a music-streaming service. Others pay up so they can avoid ads: 44% of overall consumers say ad-free streaming is the top reason for subscribing. Live video is another reason consumers pay for streaming, especially if they don’t also have traditional pay TV. The study found that 29% of consumers pay for live streaming so they can watch things like the NCAA March Madness tournament or certain NFL games. Of course, too much choice – Hulu, Netflix, YouTube TV, HBO Go, Amazon Prime, PlayStation Vue, SlingTV, and Disney’s soon-to-launch service, to name a few – can be a bad thing. Deloitte found that 47% of consumers are “frustrated by the growing number of subscriptions and services they need to piece together to watch what they want.” Discoverability is an issue as well: nearly half of those surveyed say it’s harder to find the content they want to watch when it is spread across multiple services.